What is the most resilient parasite known to man? Anyone who has seen Inception can answer that question. It’s not a virus, a bacteria, or an intestinal worm. No, the most resilient and highly contagious parasite on the planet is… an idea. I had an inception moment roughly a year ago when a highly contagious parasite overtook my brain and proved impossible to eradicate. However, this parasite was not implanted in a dream state by a team of slick-suited men and the chick from Juno. All it took was an infographicand a simple phrase: sitting is killing you. I, like many, sit for a living. And for fun. I sit at work. I sit at home. I sit when I write. I sit when I read. I sit when I eat. I sit when I watch Inception while I eat. The only time I don't sit is when I’m on my way to sit. And I’m not alone. The average person spends 9.3 hours sitting every day. Why even have legs? All this sitting masks the fact that I consider myself a relatively healthy person. I eat salads for lunch. I don’t drink soda. I don’t share needles. I hope to live a long, chronically debilitating disease-free life. I have completely eliminated high fructose corn syrup from my diet because just in case. So when I read that the thing that I spend the majority of my time doing is killing me, I did the only thing I could think of: ignored it. After all, sitting is an unavoidable fact of my life, right? But the parasite kept nibbling at my brain. Every day I strolled into work and plopped down for my eight-plus hours of practically uninterrupted sitting, I heard the same refrain: sitting is killing you, sitting is killing you. I kept looking at that infographic, and the stats became more and more alarming. Sitting for over six hours a day makes you 40 percent more likely to die 15 years before someone who sits for only three, even if you exercise. Then a seemingly endless stream of articles started appearing in my morning paper with scary titles like Is Sitting a Lethal Activity? Spoiler alert: yes. My parasite was growing obese. With each passing day, all I could think about was how my future kids would watch me die a prematuredeathbecause of high blood pressure, or diabetes, or cancer, or kidney disease, or metabolic syndrome, or any combination of the myriad negatives associated with the seated lifestyle I was leading. I had to make a change. I had to take a stand! And so I literally did just that. I stood. I took my keyboard and monitor and stacked them on top of apile of boxes, and just like that, I was no longer killing myself. I was standing. 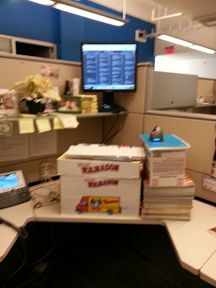 Of course, I didn’t just invent the standingdesk on my own. During my research into the ills of sitting, the standing desk (and the more aggressive and seemingly dangerous treadmill desk) were often presented as alternatives. Stand Up While You Read This suggests one NYT headline; Taking a Stand for Office Ergonomics trumpets another. It’s a trend, one that I hope, for the sake of my fellow office drones, continues to flourish. Fast-forward one year, and just like Elton John, I’m still standing—albeit at a beautiful Ergotron WorkFit-A, which replaced my make-shift rig at the beginning of 2013. Once this arrived in the mail, I stopped being the office weirdo with the pile of boxes on his desk, and some of my coworkers have started looking into how they might be able to get their hands on the same thing. Working at a standing desk, I find that I’m more focused and productive, less lethargic, and most importantly, I got rid of that damn parasite. But this being SCN and not Wellness Weekly, I find myself wondering if there was a way for AV integrators to cash in on the standing revolution. While office furniture isn’t necessarily a pro AV cash cow, hospitals and classrooms certainly are—two areas where adjustable standing workstations are thriving. Other environments that have seen huge demand for adjustable standing desks are call centers, the financial world, hospitality, and anywhere multiple people wind up using the same computer. Is your next install in such an environment? Then it might be worth looking into Ergotron’s Advantage Program, which gives bulk discounts and even provides free seeding units for you to test the chair-averse waters with.